I am no expert with most beauty DIY's but one thing I can say, is that I give a pretty decent haircut. I've been cutting my hair for years and I also cut my husband's hair as well as my daughter's. While I use scissors for the majority of the cutting, there are some things that require a hair clipper. Andis makes a variety of sets to suit your hair cutting needs. The particular set I have is called the Headstyler. 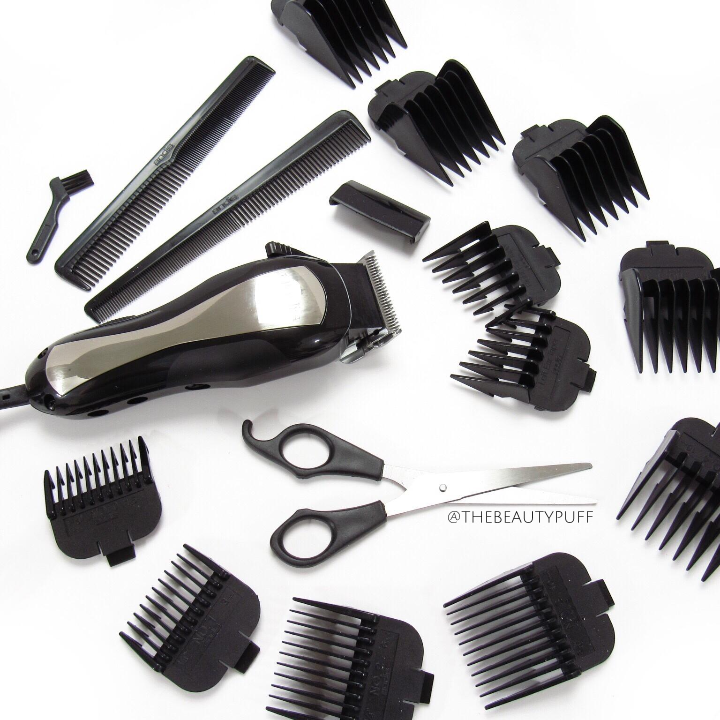 This includes a hair clipper, 12 attachment combs, 2 hair combs, scissors, blade guard, brush and oil, as well as a storage case to keep it all stored securely. The first thing that struck me about this clipper when I first opened it was the weight of it. It's considerably heavier than a rechargeable clipper but it also feels higher in quality. I actually like that this model needs to be plugged in when in use because there's no need to remember to charge anything ahead of time. Holding it takes some getting used to, but if you can manage to maneuver around the cord, it's worth it. The 12 included attachment combs accommodate nine different lengths as well as left and right tapering and blending. For my purposes at home, I would mostly use the shorter length attachments. I also like the two hair combs included because they are fairly narrow and easy to use. The scissors are not my favorite as I have others that are heavier and sharper, but for the sake of this kit, they are a nice addition. Overall, if you are looking to get a budget-friendly hair clipper for at-home use to save you money and trips to the barber or salon, I would definitely recommend checking out the Andis line of hair cutting tools. They also make blow dryers, flat irons, and assorted hair clippers with varying attachments. And a big bonus - they are made in the USA! You can find the model I have here and shop the Andis brand on Target.com below.